Taxonomy: Bumble Bee Snail Tiny belongs to the Kingdom Animalia, Phylum Mollusca, Class Gastropoda, Family Buccinidae, Genus Pusiostoma and Species mendicaria. Scientific names: The scientific name of Bumble Bee Snail Tiny is Pusiostoma mendicaria. Other common names: Bumble Bee Snail Tiny is also commonly known as Bumble Bee Snail. Origin or natural range: Pusiostoma mendicaria is found in the Indo-Pacific region including the Western Pacific Ocean, Marshall Islands and Florida. Size: Bumble Bee Snail Tiny may grow up to an approximate size of one inch. Color: Pusiostoma mendicaria occurs in black color with yellow colored horizontal bands on it. 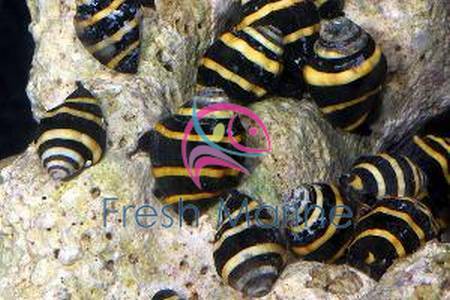 Compatibility: Bumble Bee Snail Tiny is non-aggressive towards the marine aquarium members. Habit & Habitat: Pusiostoma mendicaria is nocturnal in habit and therefore, remains hidden during the day, coming out to feed only at night. Bumble Bee Snail Tiny is very hardy. Pusiostoma mendicaria is black in color with yellow bands on it, resembling insect bumble bee and therefore, the common name. The mantle is large and fleshy and secretes the calcareous shell. Temperature of water: The temperature of your marine aquarium must be maintained between seventy-two and seventy-eight degrees Fahrenheit. Specific gravity of water: The specific gravity of water in your reef tank should range within 1.023 to 1.025.
pH of water: The pH value of water should scale between 8.10 and 8.40. Illumination: Bumble Bee Snail Tiny requires illumination in the marine aquarium it inhabits. To host Pusiostoma mendicaria, you should have a thick layer of sand with an ample quantity of rocks, rock caves and Live Rocks in your reef type marine aquarium for the snail to hide in and search for food on. Provide enough space to Bumble Bee Snail Tiny to move around in your marine aquarium. Slowly acclimate Pusiostoma mendicaria to your marine aquarium environment, in minimum two hours, using the Slow Drip Method. Bumble Bee Snail Tiny is Omnivorous in feeding habit and eats meaty bits, zooanthids, phytoplankton, especially hair algae and film algae, and polyps. Pusiostoma mendicaria is also a Scavenger and feeds upon detritus and any uneaten left out food. You can supplement the food of Bumble Bee Snail Tiny with seaweed. Cover a rock with the seaweed and place it on the substrate in your reef tank. Breeding: Pusiostoma mendicaria does not generally breed in a marine aquarium. Bumble Bee Snail Tiny is a Scavenger and eats detritus and uneaten food, thereby keeping your tank clean of perishable organic matter. Pusiostoma mendicaria is an algae eater and keeps your marine aquarium free of algae. Bumble Bee Snail Tiny searches for food in sand and ploughs it thoroughly, thereby aerating it well. Bumble Bee Snail Tiny is easy to maintain owing to its non-poisonous nature. Maintain the Calcium level in water between three hundred and fifty ppm to four hundred and fifty ppm to enable the continual growth of Pusiostoma mendicaria in your marine aquarium. Fluctuation in pH and temperature in the environment of Bumble Bee Snail Tiny may give it pH shock and temperature shock, respectively. Copper and Nitrates in any form in your marine aquarium may prove lethal for Pusiostoma mendicaria.